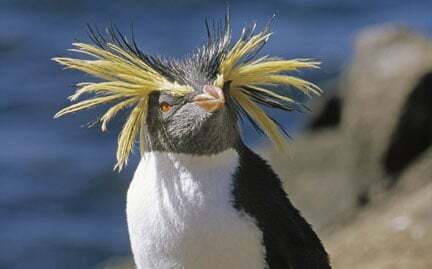 Rockhoppers are found among the coastal grasses and rocky shores throughout Southern Ocean islands. They’re the most aggressive species of penguin, and feed on krill, crustaceans and squid. While the males incubate eggs in their brood pouch for four months, they depend on females to feed them. If the female does not return to feed the male, he will regurgitate “penguin’s milk” from his digestive system to feed the offspring. Oil spills, commercial fishing and a reduction of their prey species threaten these pioneering penguins.